Rapidly growing division of a progressive company is developing a new product line to assist heavy industrial customers in the areas of preventive maintenance and scheduling. Excellent opportunity for a licensed engineer to assume responsibility for adapting this product to the U.S. market and contribute to the sales efforts necessary to realize the product's commercial potential. Successful candidate will be offered a salary commensurate with experience, ex- cellent company paid benefit package and growth potential limited only by the capability of the individual. A San Francisco based consulting firm is seeking a naval architect with basic ca- pabilities in all aspects of marine design. 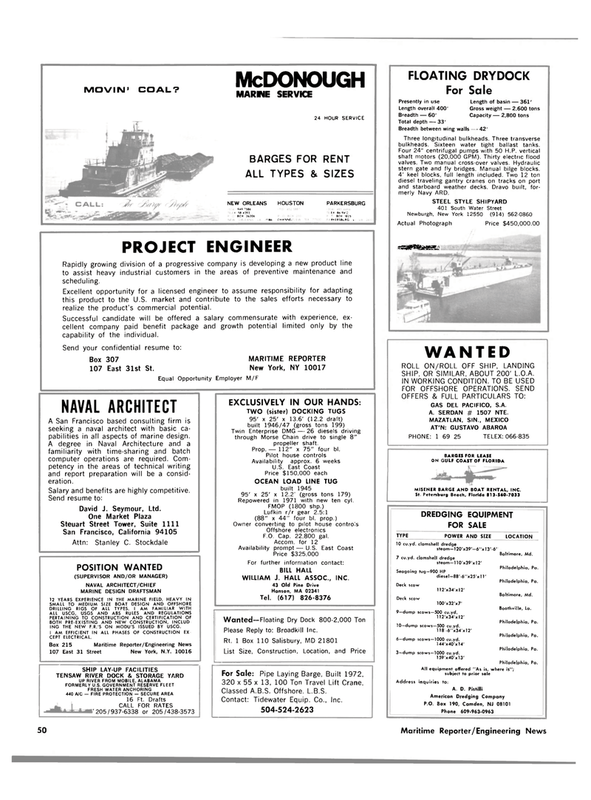 A degree in Naval Architecture and a familiarity with time-sharing and batch computer operations are required. Com- petency in the areas of technical writing and report preparation will be a consid- eration. ING THE NEW F.R. 'S ON MODU S ISSUED BY USCG. Twin Enterprise DMG — 26 diesels driving through Morse Chain drive to single 8" propeller shaft. Prop. — 112" x 75" four bl. Repowered in 1971 with new ten cyl. Please Reply to: Broadkill Inc.
SHIP, OR SIMILAR, ABOUT 200' L.O.A. A. SERDAN # 1507 NTE. Boothville, La. 9—dump scows—500 cu.yd. 112'x34'xl2' 10—dump scows—500 cu.yd. Philadelphia, Pa. 6 —dump scows—1000 cu.yd. 144'x40/x 14' 3—dump scows—1000 cu.yd. Three longitudinal bulkheads. Three transverse bulkheads. Sixteen water tight ballast tanks. Four 24" centrifugal pumps with 50 H.P. vertical shaft motors (20,000 GPM). Thirty electric flood valves. Two manual cross-over valves. Hydraulic stern gate and fly bridges. Manual bilge blocks. 4' keel blocks, full length included. Two 12 ton diesel traveling gantry cranes on tracks on port and starboard weather decks. Dravo built, for- merly Navy ARD.